Thispattern could be easily altered to fit any holiday or color scheme by simply replacing the red, white, and blue fabric with colors of your choice. Chasing Marcus was kind enough to do a review for us, you can see how her basket turned out here! 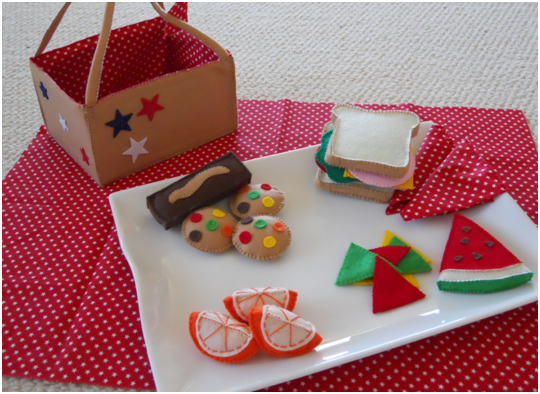 Get The Patriotic Picnic Basket Pattern here! ★Completed Basket measures approximately 9 1/4” long x 7 1/4” wide x 5 1/4” high. ★This pattern includes easy step by step instructions along with colorful photos! ★Pattern comes complete with full Scale Pattern Pieces. ★You will be directed to the download page upon completion of payment. If for some reason you are not re-directed, please email me and I will be happy to email the link to you. ★Patterns are in PDF format on 8 1/2 x 11 size paper. A PDF viewer is required to open the files. Adobe Reader is a great PDF viewer that can be downloaded to your computer for free at www.adobe.com. ★All patterns are copyright protected. Not to be distributed, transferred, or sold in any form. For personal use only. You may NOT make items for sale or profit. SO cute!! I wish I had time to do all these cute, crafty things! The Lord has certainly blessed you with amazing gifts. Thank you for sharing them with us. Blessings to you! I appreciate your generosity in sharing your things with us, but I feel like I should tell you that I am disappointed that you are now starting to go in the direction of making a profit. I was so impressed with your blog because it seemed like you were genuinly interested in sharing your God-given gifts with the homeschooling community without trying to "make a buck". Now, I read for the second time that you are selling things and I feel disappointed that you are choosing to go in this direction. First of all, there is nothing wrong is selling the things that we work hard to make. I imagine that Erica has spent hours working on many of these things and thus should be compensated for her efforts. She's also noted that she's still offering the Letter of the Week on her blog but you just have to download each one individually. She's never made it mandatory to purchase anything. I would also like to point out that God doesn't ocndemn this practice. In fact, He praises it in the Proverbs 31 woman. She sold her belts to the merchants. She planted a vineyard and made money off that. She did so well with all of this that she honored her husband and his name was known in the gates (or in our time probably gives her husband more time to focus on binging in the main income.) This is the kind of practice as a godly woman that is praised by scripture. Now to the felt food. I will definitely be purchasing this pattern. I have to pay my midwife first so it won't be until summer. 🙂 My older girls and I are going make this our summer craft project (among some of the other felt food that has been featured). I have a 16 mod and another little girl in my womb who will really benefit from this as they grow. And I suspect that my 7 yod will also love to play with these. 🙂 Erica, I hope you don't mind me defending you with my above statements. I really don't like people take it upon themselves to judge the motives of others. Especially when that judgement is in direct conflict with what scripture tells us. I am a family child care provider who just recently discovered this blog and love the resources that are offered. I did purchase the Letter of the Week by download (just to save me time) and I have been incorporating it into the preschool curriculum I am already using. Great Stuff!I am also A mother to three precious daughters ages 8, 12, and 16, and I am very committed to being at home for them. I strive to be a Proverbs 31 woman, though I fall short in many way. I want to say that I highly respect your talent, discipline and commitment to being a homeschool mom. God has given you a gift that you are using wisely and for His Glory! As the "virtuous woman" of Proverbs 31,you have taken the fruits of your labor , (your homeschool materials) to be sold to provide a better quality of life for your family. Your efforts will truly be blessed!~ Thanks for allowing me to post to your blog! God bless! Erica- That pattern turned out so cute! My kiddos would love that. I am excited about your Etsy store, everything you make is so well done and professional! Holly: Thank you so much! My mom actually made this one, we are starting the Etsy store together! I will pass on your well wishes to her!Thanks! This is just adorable! Was it hard to make? (And keep in mind… I'm no seamstress! *wink*) Do you have an idea how much the materials needed for the project will cost? Gosh, it's just so cute!